one of my most cherished things is an amazing vintage hand-me-down olive-beige trenchcoat given to me by my mom. it fits me like a bespoke masterpiece. when i wear it, strangers on the street come up and compliment me. i haven't worn it in a while, and for the time being it's safely stored in my closet back in NYC. my mom gave it to me shortly after i graduated from college, and ever since, the trench has been a special wardrobe staple. over the years, i've managed to acquire a mini collection of trenches - the first one being the gift from my mom. the second trench, from Helmut Lang and a clearance sale score, is elegantly avant-garde, and my third, the one i wear the most these days, is by A.P.C. much has been written in print and online about the virtues and stylish elements of the trench, so i won't retrace those lines here. 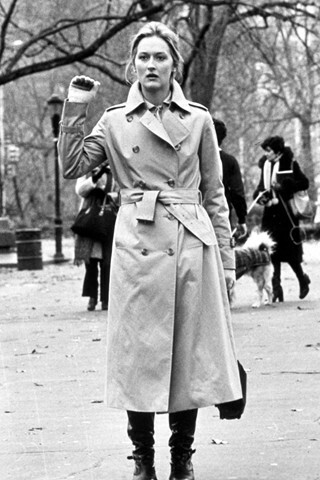 for me, a trench embodies all of the dashing legacies of military uniform in a uniquely modern, urban way. there are, of course, all the campy trench references to flashers, shady dudes trying to sell you stuff in an alley, Cold War spies, noir-esque private detectives, and Inspector Gadget. but at the end of the day (and especially in the beginning of spring), the trench is a no-nonsense utilitarian coat that makes you look good while you're trudging through a rainstorm. the material and cut is excellent - mine is the size 34. it's fitted around the shoulder area but still has a somewhat roomy cut throughout, as befits a classic trench that drapes properly and has room to layer underneath. the fabric of mine is 100% cotton, and it is a substantial, quality cotton gabardine, which is a thicker material that holds its shape and 'hangs' well. i prefer my classic trench to have a slight structure to the material, as opposed to lesser-quality versions that are overly filmy, prone to wrinkling, and too light. all the buttons and stitching and details (ie: the lapel, epaulet, belt buckles etc) feel solid and sturdy. the only thing i did was to take my trench in to my trusted tailor and get the sleeves shortened slightly so that they would hit right at my wrist. this called for a somewhat tricky alterations job as my tailor had to move the sleeve buckle loops up to where he shortened the sleeves, but he did a fantastic job. (i prefer the slightly cropped-sleeve length on my trenches.) the length hits me right at the knee, and a little higher if i'm wearing heels. overall, it's easily one of my favorite spring foundation pieces year after year. when it comes to the trench, i'd recommend buying the best quality that you can afford. this is an item that is worth splurging a bit on, and you'll be able to wear the one you buy for years and years. do you like the trench? if you have one, how do you like to wear yours? 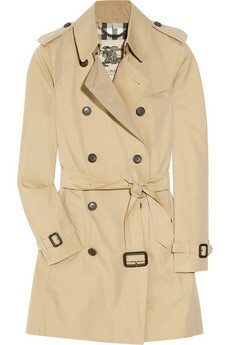 I have a trench, but it is an inexpensive I had gotten from H&M a year or two ago. The material is thin and doesn't hold well, and the belt is too short and is placed too high! Definitely an impulse and sort of regrettable purchase for me. It serves its purpose for now, but I am definitely on the lookout for a proper, well-fitting trench with a heavier material. I like the styles from both Burberry and A.P.C. I wished I knew where to find A.P.C. in Montreal so I could try their trench before buying, since it costs a pretty penny. A lot of trenchcoats I've found have an full skirt shape (like the H&M one I have), it's somehow really hard to find a straight-shaped one here! I have a black wool trench that I absolutely adore--you're right about the fit being really crucial to creating a polished look, as is a heavier-weight material. I've been casually looking for a few years for a good tan light-weight trench, but as you have noted, most often the material or cut is unsatisfactory. I suppose one day I'll have to swing for the bleachers and buy a more expensive brand, like Burberry. Also, I've been hampered by the weather in my region, which is not only rainy but cold most of the time. So a light-weight coat like a cotton trench is usually not warm enough, unless it's thickly lined. I may have to go for a parka one day, cousin of the trench coat, just for a thicker coat. I have a Burberry which I purchased after several others did not make the grade. I think the style is called Marlybone? but anyway they have many and the salesperson helped me find the one for my body type. Mine is black because beige makes me look sick and I wear it with darn near everything. Favourite ways to wear are with trim ankle length pants, flats and a striped top, with my Michael Kors "stormy" boots, skinny jeans and a sweater and thrown over a dress, any dress. The cost per wear will be low for me as I wear this all year and the quality of the garment should ensure it lasts for years. If I go for a colour pop version I may well shop down the food chain. It took me a very long time to find a good one at a price I could afford - mine is French, a shorter length one from Paul and Joe. last one on big sale! I'm really happy with it. I got it at Yoox, it was really good luck - I'd say it compares to APC in quality, it is a little more green-gray in color but otherwise very classic. I love the APC trench and always eye them every season but I know I can't wear that particular shade of khaki, it washes me out. I love your blog Miss Sophie, thanks for your great essentials advice! hehe thanks for your comment! it always makes me chuckle when i see the trench in some cartoony or funny pop culture context. btw Inspector Gadget was a great show! 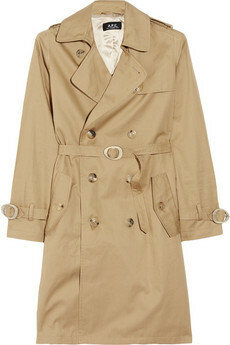 I have a Burberry trench that is about 14 years old, the classic style and color - I love it and wear it often. 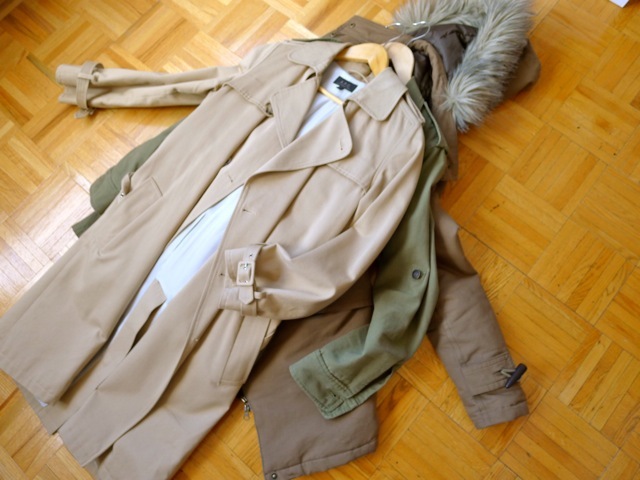 Don't save trench coats for the rain! hehe i know - i often wish spring would last longer so i could wear my trench more often! I'm like Nancy - beige isn't my color so my trench coat is black. It looks quite traditional from the front, but has this really nice pleating in the back that makes the bottom flare out a bit and makes the whole look a teensy bit edgier. I absolutely love it. Your “heirloom” trench sounds so special, you must feature it! Also your APC one looks quite chic. I used to wear a trench at least once a week regardless of season, but I got sick of the snide comments so I stopped. :/ But if I wear my really beat up satin “evening coat”, I get compliments, go figure. I love long coats in general. I have 6 total (black db, black satin “evening coat”, dark denim db, leopard satin trench, 2 missoni/target ones). No beige because it looks terrible on me. I wouldn’t mind to find a purple one like the Joker. Sometimes I want a black patent one, this would be my dream one. Apparently, there's a coffee table book dedicated to the trench. I love the trench, maybe one of these days I'll do an ode to it. 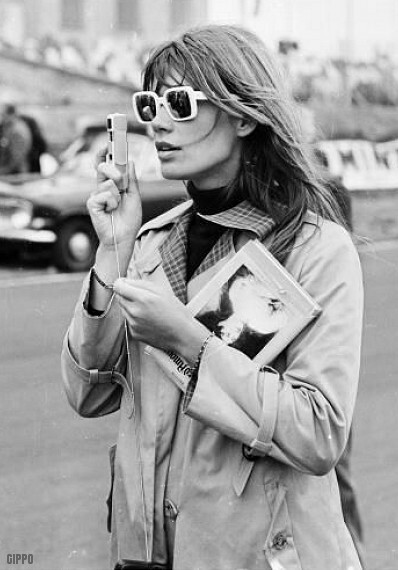 I think of Victoria Beckham circa 2003/2004 and Angelina Jolie looking very chic in trench coats. And Jef Costello of Le Samourai and Marcel of Belle De Jour. -ps. And I loved Inspector Gadget and Carmen Sandiago as a kid. I was browsing my tumblr archives the other day and it became blatantly clear that I am OBSESSING over trenches at the moment. I think it might be this in-between weather we're having in sydney. I do have a trench, it was a bargain buy from a mid-range aussie high st label and it's alright but it's not perfect. A trench is either perfect or it's not, you know? I love the one that Meg Ryan wears in You've got Mail - it's massive, which I think is how I prefer my trenches. Like Meryl streep in the picture above! Your apc trench sounds perfect though. I agree with you that a slightly heavier garbadine is the best way to have a trench. I can't bear flimsy trench material. It's supposed to keep you dry, after all!! I love Emmanuelle's daughter outfit! I'm so going to copy that look when the temperatures go up a little more! My current trench is a Zara, from about 2 years ago. So far it holds up nice for its price and considering it's my n°1 go-to outerwear in mid-seasons. When comes the time to replace it, my search will be based on its shape, cut. Like you I prefer a straight line. I tried the longer knee length but find that the shorter version is more flattering on me. I love the gaberdine feel about my trench. I love the stiffness and structured feel the thicker cotton gives. I have the classic one at the moment but I think I need to add black one to my closet too. Hi, I came across your blog while trying to research a fab trench coat i luckily aquired at a thrift store. The only label is HL....I don't know it its Henri Lloyd but it does not look like his label. So I will check out Helmut Lang. Its just so classic and fits me really well because I am very petite so I have a difficult time finding jackets. Any info would be welcome.